Lying passed out on the floor with a needle stuck in his arm, “Jasper” is no dummy. It is a human simulator posing as a man who overdosed on heroin to teach medical students at The University of Toledo how to save a drug addict’s life. Toledo Fire and Rescue Department paramedic students administered Narcan to the simulated heroin overdose patient inside the staged apartment. 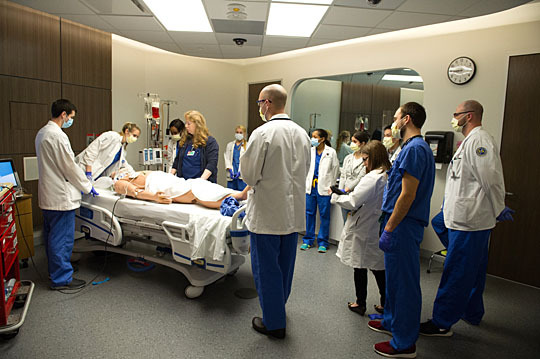 In front of an audience, students training to be doctors, nurses and emergency responders were put to the test with a heroin overdose simulation in UT’s Jacobs Interprofessional Immersive Simulation Center on Health Science Campus. The real-time emergency situation — from the staged apartment to the simulated hospital room — was broadcast to a crowd of recovering heroin addicts, Toledo police and fire chiefs, UT faculty and staff, and community partners to increase education about Ohio’s heroin epidemic. Third-year medical student Nathan Marcinkowski led the team in a state-of-the-art medical simulation suite, which served as the ER for the heroin overdose exercise. EMT students got experience administering the antidote drug Narcan, which is now available at pharmacies over the counter, and transporting the patient to the simulated emergency room. Since Narcan — also known as naloxone — wears off before the overdose, medical students then took over and ran through all of the life-threatening complications that come with a drug overdose. 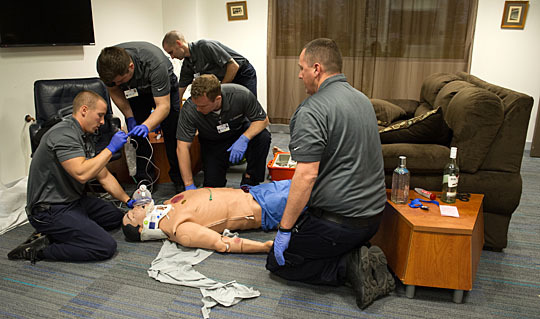 Students training to be doctors, nurses and physician’s assistants worked together to save the human simulator suffering from complications that resulted from a heroin overdose. Third-year medical student Nathan Marcinkowski was the team leader. The simulation was a shock for Matt Bell, who sat watching in the audience. Bell is co-founder of Team Recovery, a local organization of recovering heroin addicts who are working to help other addicts get sober. Team Recovery holds family support group meetings once a week. Representatives also share their stories in school classrooms from sixth grade through college to spread prevention awareness. This entry was posted on Friday, March 18th, 2016 at 3:16 am and is filed under Features, Medicine and Life Sciences, Nursing, UToday .